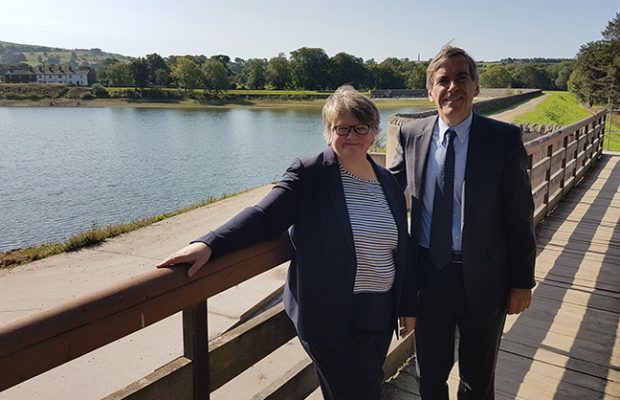 Environment Minister, Dr Thérèse Coffey MP, recently visited Teggsnose and Bottoms Reservoir in Macclesfield, to learn more about the steps being taken to respond to the ongoing period of dry weather has had on the North West. Accompanied by local MP, David Rutley, she was joined by representatives of the Environment Agency and United Utilities. David and Dr Coffey reviewed the effect the ongoing period of dry weather has had on the region and heard how the issue of dry weather in the North West had been managed and how United Utilities had been communicating the effects with their customers. The visit follows a recent application to the Secretary of State by the Environment Agency for a drought order covering Teggsnose and Bottoms Reservoir. If granted, the drought order would lower the amount of water United Utilities are legally required to release downstream, to protect the natural environment and preserve water levels in the reservoir. As a result, flows in the River Bollin in Macclesfield will reduce, in order to ensure flows downstream can be sustained for longer. Under the drought order, the first since 1995, the Agency set out an Environmental Monitoring Plan which details how they plan to mitigate environmental impacts to any flora or fauna, which are dependent on a certain level of water supplies for the coming months. The latest drought order comes following one of the driest summers since August 1995. In the last three months, the Environment Agency says it has responded to more than 2,000 incidents relating to dry weather from fish caught in pools due to low flows, fish kills due to low oxygen levels, reports of Blue-Green algae, and moorland fires. According to the latest statistics from the Environment Agency, the region has only received around half of the rainfall normally expected during May to July and current forecasts are still set for a drier than average autumn. The agency has also warned that despite some recent rainfall, the issue of prolonged dry weather seems far from as over as soil moisture deficit is so high across the region, it hasn’t stopped reservoir storage dropping further.